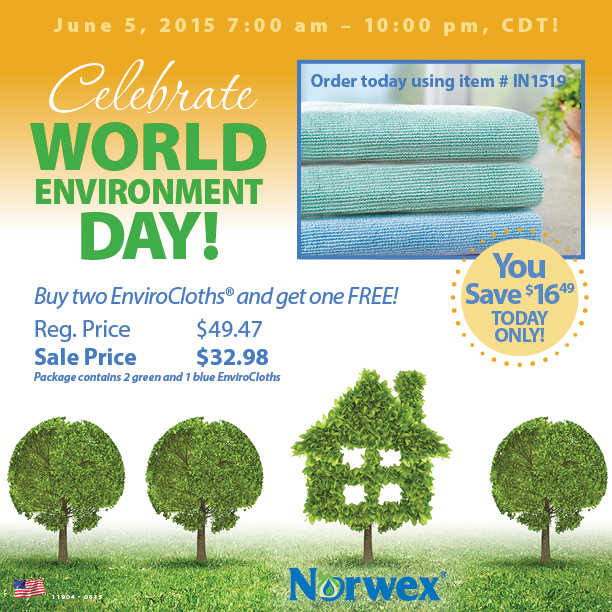 Starting today only June 5, from 7:00 a.m. – 10:00 p.m., CDT, you may purchase 2 green EnviroCloths® and receive one blue EnviroCloth FREE! A $16.49 savings. This special is available on all orders, but you will need to hurry, it expires at 10:00 p.m., CDT! You must make your payment of $36.93 (includes $3.50 shipping) to my Paypal Account: urbanhome@tds.net. (Paypal payments only require a credit card.) You also may call me at 970-778-8559 for more information. Payments must be received before 9:00 PM MDT. Use it wet or dry to clean EVERYTHING with outstanding results. Use it dry to dust, holding the smallest particles in its fibers, creating a cleaner surface in less time without leaving a harmful chemical residue behind to collect dust. 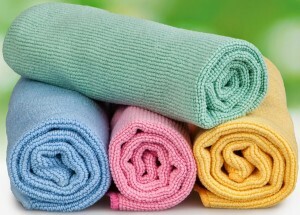 Use it wet to loosen and lift the most stubborn dirt and debris up into the cloth and away from the surface.Between laundering simply rinse, wring out and hang to dry. Cloths measure 13 X 13. World Environment Day is celebrated each year on June 5, in order to bring worldwide awareness and action to the environment. As a Norwex Consultant, I know I haven’t talked about it lately, but I want to take this opportunity to remind you that one of my missions is that of improving the quality of life by radically reducing chemicals in the home. You can create a safe, chemical free haven for your family, by using environmentally friendly Norwex Microfiber products that only use water. Do your part to bring recognition and a source of action to the environment in your community and across the globe by taking advantage of this special offer. Here is a current electronic _Norwex_2015_Product_Catalog. I am still a consultant but I don’t currently have an active Norwex consultant website. You can save $16.97 by placing an order at Paypal Account: urbanhome@tds.net. « Rich or Poor, Success or Failure?